« Cinque Terre…Bad Luck, or Adventure? Life has settled down back to normal after my haphazard trip to the Cinque Terre. Classes are still going well and keeping me busy, theater is getting a little more intense, and tutoring is still wonderful! I’m really happy that tonight, I’ll be having dinner with my tutoring family :) really looking forward to it! 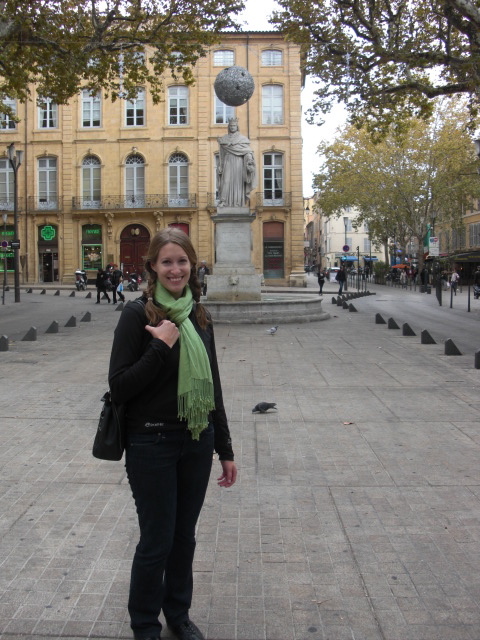 This past weekend, our CSB/SJU group took a day trip to Aix-en-Provence. It was really nice to get out of the College for a day, and it was nice to be someplace that felt a little more like fall. It’s a 2 hour drive to Aix from Cannes, so it passed by pretty quickly. Once we got there, we had a quick tour of the city and then were allowed free time for 3 hours. 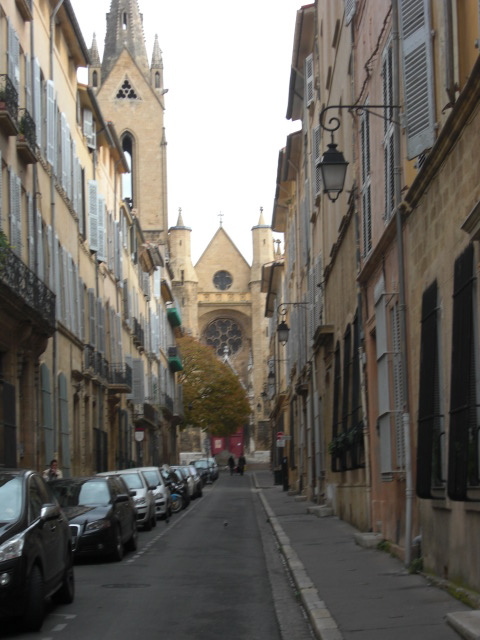 Aix is very pretty, and feels very collegiate – it’s a big university town. There aren’t a lot of tourist sights, so Mickey and I just wandered the streets and did some window shopping. Afterward, we all left to go to l’atelier de Cezanne – Cezanne’s studio. It was the last studio he used before he died. I was a little surprised that it was so small! It’s a very small cottage house, and the actual tour is just one room upstairs. I’ve realized that I’m not really into art, so the tour didn’t interest me as much. Afterward, we just came back to the College. This weekend, Mickey and I watched some of the movies we had borrowed from the mediathèque, the library, down the street. On Friday, we watched the movie Persepolis – and I loved it! It’s a great movie, and very artistic. It’s about the revolution in Iran and the radicalisation of Islam through the eyes of a young girl. Later, her parents send her to Austria to escape the war. The movie is about her coping with her identity, feeling like a stranger, and feeling like a stranger in her own country. And, it’s all animated! I was very proud that we watched the whole thing (in French, bien sûr) and I understood all of it! We had to watch with subtitles (in French), and that helps enormously. It’s still too difficult to watch movies without subtitles – it’s much easier when I can read what they are saying. On Saturday, we watched La Môme, or La Vie en Rose. It’s a movie about the life of Edith Piaf, a very famous French singer. It’s very well done, but a depressing story. Tomorrow…we leave for PARIS!! I am so excited! Originally, we were going to leave for Paris on Thursday, but there is going to be a big strike then and we will have to leave a day earlier to get there. I don’t mind though – now we have an extra full day in Paris! We will be there until Monday afternoon (my birthday! )- so we’ll have 4 full days there! EXCELLENT. I think it’s really cool that I get to wake up in Paris on my birthday. The trip is not very structured – we will have a ton of free time. Beth will give us suggestions of things to do each day, but it’s up to us what we want to do. There are only a few required things: Friday morning, we will give our Revolutionary tour of Paris. Each of us has to present a site in Paris that has significance to our historical character (the character we played in the game for our class). Friday night, we will go to the Louvre as a group. Then Beth also has some optional things, like a boat tour down the Seine river at night, and a trip to Versailles on Sunday. I am so excited! So, I won’t be updating again until after we return from Paris…about a week from today. When we return to Cannes, I will only have a couple days before I head off to Rome! Life is good. In the meantime, check out the Lost Girls website on Thursday: www.lostgirlsworld.com I’m going to have a new piece up on Thursday, another re-telling of my weekend in the Cinque Terre. Hope you have a great birthday, what a way to spend it. I am sure most people would love to wake up in Paris on their birthday, and for you it will be real. I am so glad you are having such a great time and what a learning experience.